1. With the cherries, drain all the fluid, and soak the cherries. Add sugar, mix well. 2. Working surface with a little flour. Roll out the dough to a length of 2-3 mm in thickness (to roll in one direction). 3. Cut it into squares with sides of 10 cm. 4. Lubricate the squares lightly with beaten egg. 5. On one half of the square to the cherries, sprinkle a little starch.Close, slightly flatten the edges. 6. With a fork along the edge of the puff to make a pattern which will also gum up the dough. 7. Put on a baking tray, covered with baking paper. Lubricate the beaten egg. 8. Put in a preheated 200 degree oven. Bake for about 20-25 minutes. 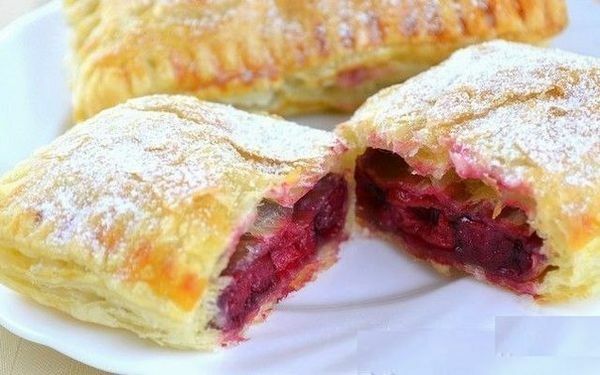 Ready puff to cool, sprinkle with powdered sugar.